Most parents are well aware of the importance of taking care of their children’s teeth, so it comes as a shock when they learn their toddlers have cavities during a checkup. Tooth decay among young children is on the rise and many experts believe that sippy cups containing sugary beverages are responsible. Because sippy cups prevent spills, they’re often used by children for long periods of time over months and years rather than as a transitional drinking device, a purpose for which they were intended. 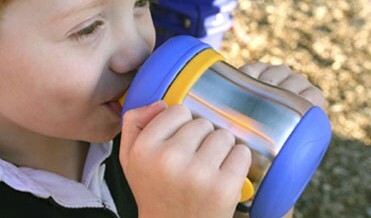 “Sippy cups were created to help children transition from a bottle to drinking from a regular cup, but they’re too often used for convenience,” says American Academy of Pediatric Dentistry (AAPD) President Philip H. Hunke, D.D.S., M.S.D. “When kids sip for extended periods on sugared beverages, they’re exposed to a higher risk of decay. Sippy cups should only contain water unless it’s mealtime.” In fact, a report from the Centers for Disease Control and Prevention (CDC) comparing the dental health of Americans in 1988-1994 and 1999-2002 found that while cavities decreased among older children, cavities in two- to five-year-olds actually increased 15.2 percent. If you have any questions about sippy cup use and your child, call our office and ask a team member for help.